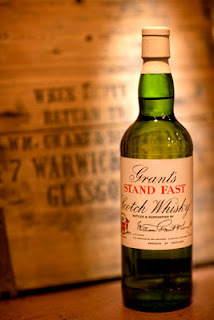 The story behind the Grant's Stand Fast blend is a good one. 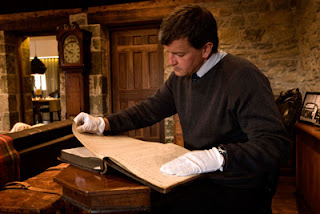 Paul Kendall, the brand archivist for William Grant & Sons (pictured, above), discovered the company's original whisky blending book in the family archives. This book was thought to have been lost but revealed the exact recipe, quantities and details of the first ever version of William Grant's own blend, written by the man himself. This was labeled in the book as 'Blend No.1' and was recorded on 11 June 1912. It was to be this 'Blend No.1' that we would be trying to recreate as closely as possible. Since 1912, the Grant's range has risen to become one of the best sellers in the world. The main markets are the UK, France and South America, especially Ecuador and Venezuela. Sales in other emerging markets such as eastern Europe, Taiwan and the travel retail/Duty Free sector are also increasing rapidly. 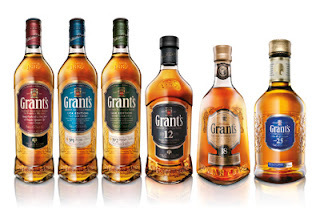 The Grant's brand sits comfortably in the world's top three for the sales of blended whisky, behind only the Johnnie Walker and Ballantine's ranges. The current range (pictured, above) sells 54 million bottles of whisky a year and is sold in 180 countries. The modern day recreation of the original Grant's 'Blend No.1', or Stand Fast as it became known, took place exactly one hundred years to the day since that first recipe was recorded in the discovered blending book. The blend was named Stand Fast after the Grant family's clan motto, which can be seen in numerous locations around the Glenfiddich distillery and most poignantly on William Grant's headstone in Dufftown cemetery. It was Monday 11 June 2012 and Ludo had invited seven whisky journalists and bloggers to join him and Brian to be part of the historic process. 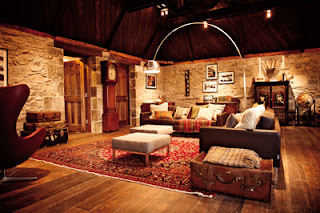 The recreation of the original Stand Fast blend also doubled up as the official opening of the new Grant's Family Home, which is a new facility housed inside the old kiln and pagoda at Glenfiddich. 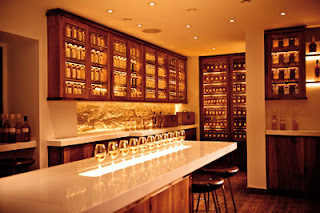 This plush new space includes a dedicated blending room (pictured, above), a dining room and The Family Room (pictured, below). It is highly impressive - the blending room has cupboards lined with the various sample bottles used to create the Grant's range of blended whiskies and The Family Room houses historical artifacts belonging to the Grant family, including the original hand drawn plans for Glenfiddich. The recreation of the 1912 version of Stand Fast presented a couple of immediate problems. Firstly, two of the distilleries included - Caledonian and Cambus - had not been in existence for a long time. Caledonian was located in Edinburgh, founded in 1855 and closed in 1988, while Cambus was located near the town of Alloa, founded in 1836 and closed in 1993. Secondly, some of the whiskies used were only two years old. This would make any exact replica illegal under modern laws regarding Scotch whisky, where the minimum age has to be three years. Thirdly, there was the presence of something simply labeled as 'sherry grain' in the recipe - the distillery of origin was unknown. Therefore, some artistic license was going to be needed - some older versions of Caledonian and Cambus grain whiskies were used to pay homage to the original recipe, three and four year old whiskies were used instead of the two year olds and ex-sherry cask matured grain whisky from William Grant & Sons own Girvan distillery was used instead of the 'sherry grain' so as to create a link with the modern DNA of the current range of Grant's blends. The original Stand Fast blend contained 18 different whiskies. Brian Kinsman, who is only the sixth person to hold the position of Grant's Master Blender, started off by explaining that we would be starting with the grain whisky, which made up around 60% of the blend. This is how Brian begins all of his blending, as it gives the foundation upon which to build the final blend. He diluted each of the different components and passed them around for our assessment - 2x North British (a three and a four years old), 2x Port Dundas (a six and a nineteen years old), Caledonian 26 years old, Cambus 24 years old and ex-sherry cask Girvan five years old (which replaced the 'sherry grain' from the original). Brian and Ludo then mixed up the grain whiskies using the ratios from the original 1912 recipe (apart from the older Caledonian and Cambus, which were used more sparingly). After a discussion and mini tasting session within the group, it was decided that this 'foundation' was a little spicy and particularly dry on the finish. After a couple of further tweaks to the percentages, the group agreed on the grain whisky part of the blend. It was difficult as there are no samples of the original 1912 version of Stand Fast to compare with, but Brian's skill and insight helped us greatly. Then followed the single malt part of the process, which adds the depth and complexity to the blend and these are used to accentuate and enhance aromas and flavours. There are 11 of these in total with most coming from William Grant's own distilleries - four different Glenfiddichs aged between six and eight years of age and six different versions of Balvenie aged between eight and 14 years old. These included a rare peated version from each distillery, which were shown to be present in the original. The final single malt was a nine years old Highland Park. Again, Brian and Ludo mixed up this part using the original set of percentages (pictured, above). They prepared the 'final blend' by mixing the two parts together - 60% grain base with 40% single malt. When passed around the group, this was a bit feisty and quite smoky. As it was at the natural strength, Brian watered it down to roughly to the bottling strength of 40% ABV so that we could assess the aromas and flavours properly. It was agreed that it was still too smoky, so the single malt component was tweaked a little and the re-mix produced a unanimous result. Our 2012 version of Stand Fast was delicious. One last problem presented itself - as mentioned, the final blend is to be bottled at 40% ABV so therefore cannot be chill-filtered if any authenticity to the original recipe was to be maintained. This process which removes the elements that make the whisky go cloudy when cold or with ice added, is a relatively modern addition to whisky production. Again, a bit of artistic license was required. Brian and Ludo had done some research and discovered that whisky was sometimes filtered using egg whites, in a similar way to how it is used in the wine industry. Therefore, our 2012 version was to have egg white added and be left for a week so that the 'undesirable' compounds are separated out and removed. The physical construction of the blend and the thought processes behind it were fascinating, but more so it was listening to and observing Brian at work that stole the show. Such an opportunity to spend time with a man at the top of his field is rare and made me realise that I have much to learn about blending, blended whiskies and whisky in general. Ludo's knowledge of the Grant's brand and his contribution to the process should also not be underestimated. There will only be 100 bottles of the 2012 Stand Fast, which Brian and Ludo mixed up once we were ferried back to our hotel. The whisky will never be for sale, with all but a few being stored in the William Grant & Sons archives. Each of us in attendance on 11 June will receive one bottle, which is amazing and priceless. The whisky will be bottled in a recreation of the original bottle from 1912 (pictured, above) and presented in a wooden casket similar to that which the whisky would have been transported in. 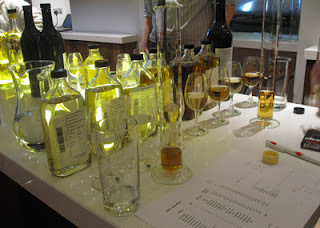 Once the blending was finished, the superb day continued. The other highlights included a ride in a 1927 Rolls Royce complete with a dram of Grant's whisky, dinner in the new dining room followed by drinks (including the first proper taste of our Stand Fast from a couple of hours earlier) and plenty of chat with my colleagues in the new Grant's Family Home. At the beginning I mentioned that the event sounded amazing on paper ... well, it was even better in reality. I feel privileged to have been asked to be part of it. If you ever get invited to go to the Grants Family Home, I hope that you enjoy it as much as I did. I'm sure you will. A huge thanks to Brian, Ludo, Nisa and Liz for everything and their hospitality on a great day. 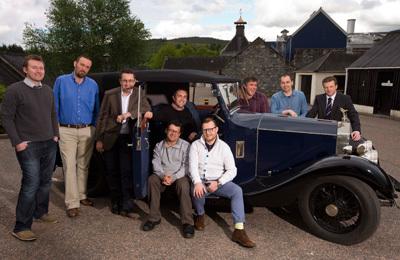 The Grant's Stand Fast recreators (left-right) - Chris Hoban (Edinburgh Whisky Blog), Iain Leslie (Dram Per Day), me, Dominic Roskrow (The Whisky Tasting Club), Ludo Ducrocq (Grant's Global Brand Ambassador), Joel Harrison (CaskStrength), Jason B. 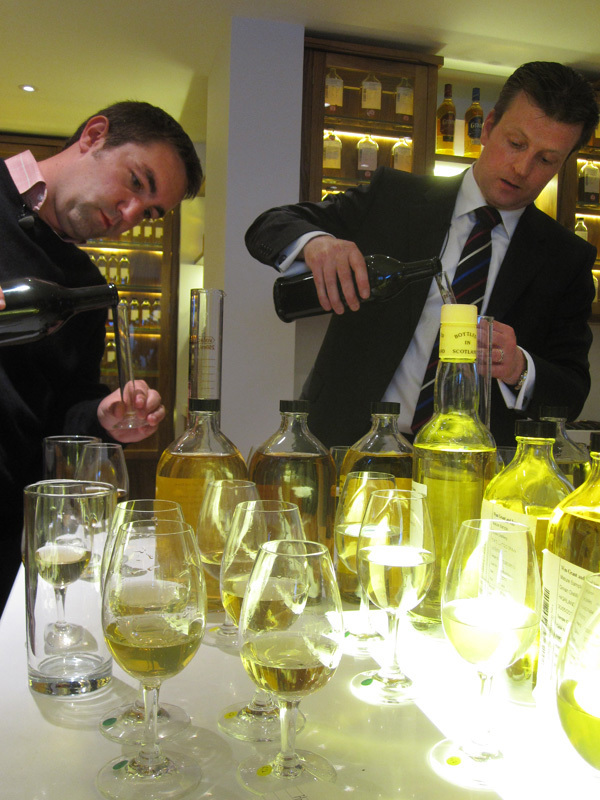 Standing (Whisky Squad), Darren Rook (The Whisky Guy) & Brian Kinsman (Grant's Master Blender).